LONDON - The Labour party has decided to bypass its agency Saatchi & Saatchi for its next political ad, inviting voters to submit their own election campaign ideas. 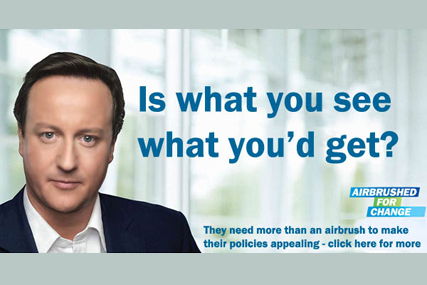 Following the successful uptake of the user-generated spoof airbrushed Conservative posters, the party has sent an email to supporters inviting them to take the mydavidcameron.com campaign "even further" by creating an ad from scratch and submitting their ideas to a dedicated website. The news comes just days after the Conservatives drafted in old bedfellows M&C Saatchi to assist with its election campaign ideas. The email to Labour's supporters explains: "Our ad agency, Saatchi and Saatchi, have produced some great work for us (and unlike the Tories, we'll be sticking with our agency) – but we want to see if you can do better." The party is looking for a poster that "delivers the most effective Labour message". Further explanation of the on the exact brief can be found at the website which adds that the party is seeking a campaign that promotes Labour's pledge to protect frontline investment, as well as highlighting David Cameron's "lack of substance". Tips from the Labour party's advertising guru Philip Gould on how to create the perfect political ad can also be found on the site. The party will be judging all creative entries submitted by 5pm on the 31st March, with the winning campaign securing a digital poster site in London and Manchester over the Easter weekend. Robert Senior, CEO of Saatchi & Saatchi, said: "The Conservative Party's pungent whiff of entitlement has unlocked creativity up and down the country. Our idea is to capture and celebrate this, amplifying the voice of the people, offering up an active role in this election before it has even been called." Join the debate on Brand Republic's Red, yellow and blue election blog.